Projects based on social development. Main Page Part 2 With the list of categories and a relevant project. User profile. 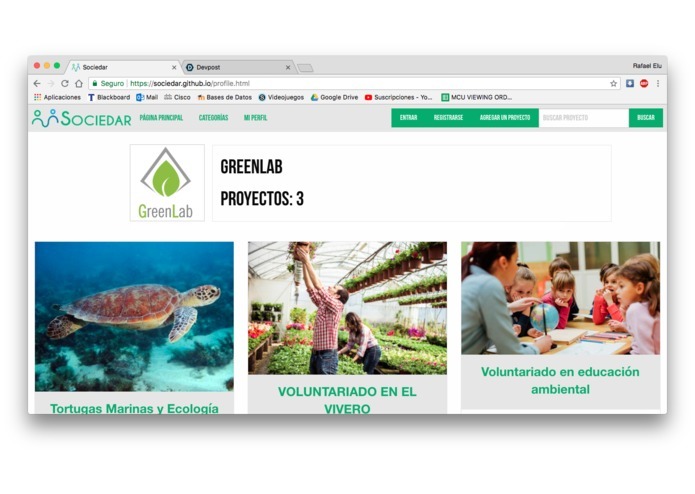 The user can see, edit or remove the projects that they uploaded. As we started brainstorming for problems to help eradicate, we realized that instead of focusing on one problematic, we could give the tools for everyone to help attack the problematic that he or she was wiling to. 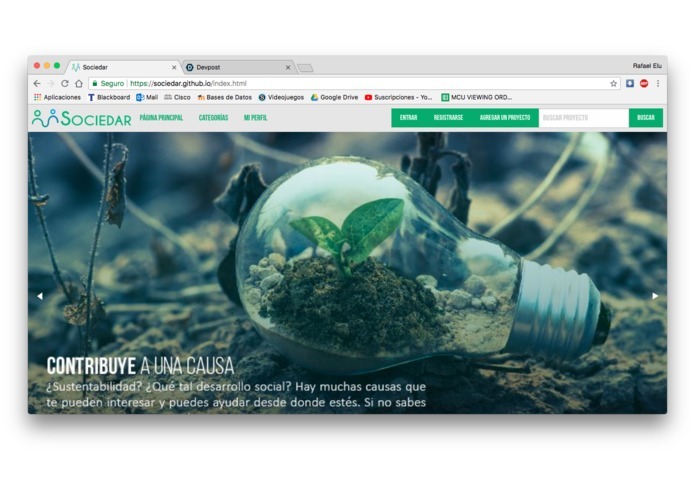 It is a platform in which foundations can upload their social impact projects, with a brief description and in the category that it belongs, so people can see which project to help. The value about it is that a person could look for already running projects, by category, in which they could help. 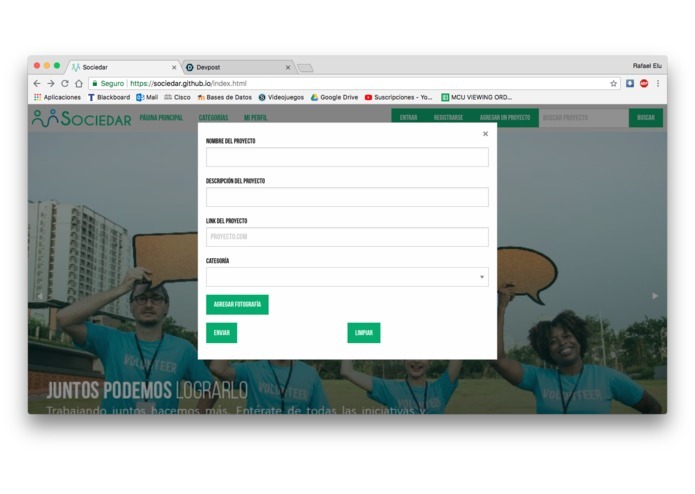 This platform is not limited to helping eradicate only one problematic, but instead people can choose where to help, all in one easy and convenient place. We had some issues with using some of the tools that Foundation gave us, specially with images. 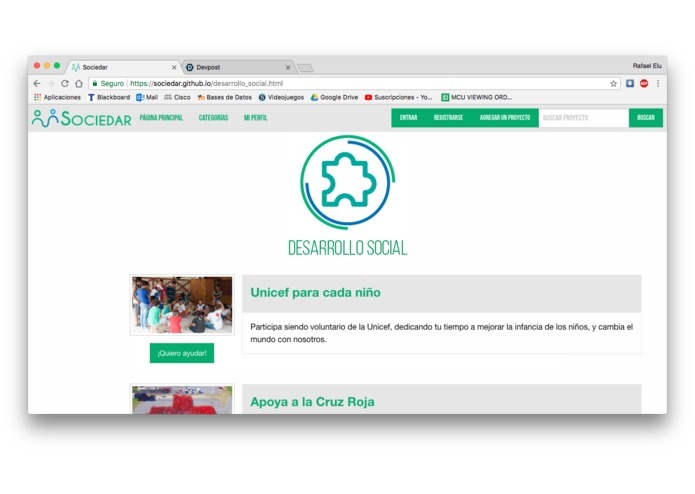 But in the end we came through with it and delivered a webpage that has the layout and graphics of what could be an impactful platform in the Mexican context. That we could come through all the problems that our lack of expertise in Foundation and web development created. 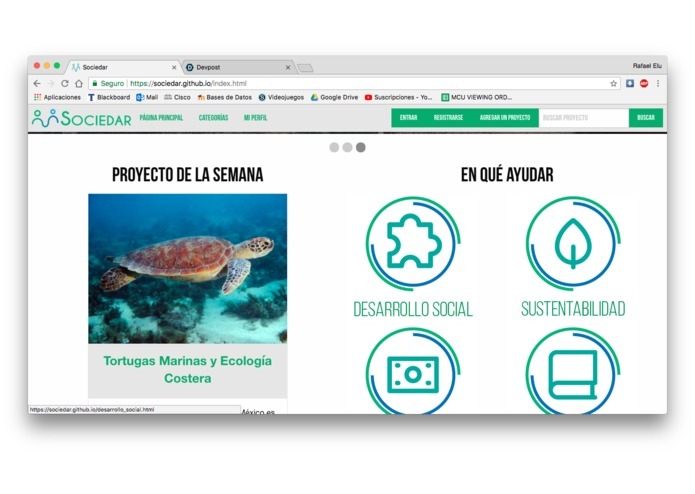 We learnt about how to use Foundation better, the importance of UX in a webpage that is meant for the biggest audience that we can get, and how there are a lot of foundations and projects that help reduce almost every problematic there is. Implement a Data base so we can have a running Login, Register and data management properly. Also, the way Sociedar is sustainable would be to charge the foundations if the want any kind of preference in the platform, much how Google does it. If that isn't sustainable, we could include adds in our page to make some money. The next step would be to include a sorting system of the projects based on geolocation of the user, so that one could see first the projects that are closer to him/her. I worked on the user interface of the web page, as well as unifique the porject in only one peace.